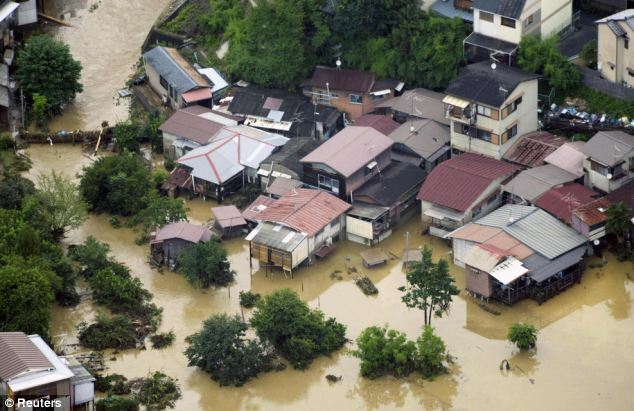 The Japan Meteorological Agency warned of landslides and rising river levels as the heavy rain may continue through Sunday in the Kinki region including Kyoto, Hyogo and Osaka prefectures, part of which is still reeling from a deadly quake in June. At a construction site in Inagawa, Hyogo Prefecture, a worker died after being washed away in a drainage pipe with two others. He is believed to be a 59-year-old man from Wakayama city. The rain also disrupted traffic and caused landslides in the city of Otsu in Shiga Prefecture and the city of Kobe in Hyogo. Evacuation orders were also issued for locations in Ibaraki, Osaka Prefecture, an area hit by the magnitude-6.1 quake on June 18. In the city of Kyoto, a rise in the water level of the Kamo River running through the city's central area led authorities to prohibit people from entering its riverside promenade, known as one of the city's sightseeing spots. A bridge across the Katsura River in Arashiyama, another famous tourist attraction in the city, was also closed due to the same reason. Multiple express and local trains were cancelled and an expressway connecting central and western Japan was partially closed, according to railway and road operators. The weather agency says heavy rain of up to 70 millimetres per hour is expected through Friday in the Kinki region. In the 24-hour period through 6 a.m. Friday, up to 350 mm of rainfall is forecast for the area.